EverEdge Scalers are sharp...EverEdge 2.0 scalers and curettes are even sharper! Using an enhanced finishing process, Hu-Friedy's professional artisans are creating edges that are scientifically measured to be over 60% sharper than the next closest competitor. Less force means easier, more comfortable scaling for the clinician and patient. 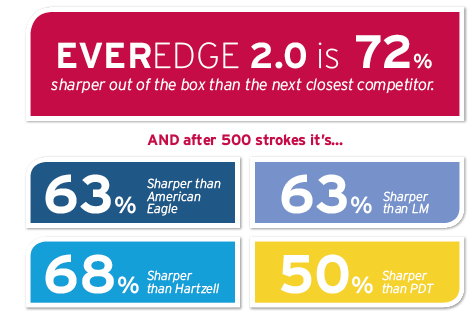 Everdedge 2.0 uses a new, optimized heat control process in order to maintain the hard, sharp edge. This heat control, plus several manufacturing intricacies in Hu-Friedy's proprietary process, provide the durability needed for effective procedures and continued use. All EverEdge 2.0 Resin 8 Colors are available in lightweight resin handles use a color-coded system to easily identify scalers & curettes that correspond to areas of the mouth. Since the special characteristics of EverEdge 2.0 scalers are present throughout the entire blade, you are able to sharpen them at any point to extend their useful life while maintaining the integrity of the metal.